The Corning Cable Systems Model M90 Fusion Splicer remains the ideal machine for long-haul telephone and CATV single-mode fiber splicing where accuracy is imperative. The LID-SYSTEM® Unit (Local Injection and Detection System) monitors light injected into the core of the fibers and provides the lowest splice loss possible with the most accurate loss readings in the industry. The recent addition of patented maintenance-free electrodes provides even more value by eliminating the time spent cleaning and replacing electrodes. The accuracy of the LID-SYSTEM Unit and its power through splice loss measurement method eliminate the time consuming task of evaluating splices with an OTDR. The 1300 nm LID-SYSTEM Unit first optimizes core alignment in each of the X, Y, and Z axes. When the fusion process begins, the M90’s unique Auto Fusion Time Control monitors the power level through the splice and completes the fusing process when splice loss is a minimum – ensuring the best splice possible. Finally, the LID-SYSTEM Unit measures splice loss by comparing power levels before and after the fusion process. 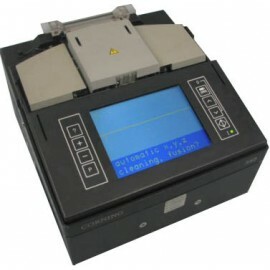 Over 1,000 splice loss results may be stored in memory and then printed directly from the M90 or downloaded to a PC for network management records. A newly added PCMCIA slot allows for extended memory and future upgrades. The unit also precisely evaluates the cleaved fiber ends – a basic prerequisite for good splices. By clamping on fiber coating, high-strength splices can be made. Messages and splice loss results are shown on the M90’s high-contrast, large 5.5-in color LCD. Fixed lenses magnify the X and Y views of the fibers 100 times and project the images simultaneously on the screen or to an external monitor. The M90’s new Series 6000 software stores 50 programs with user-defined splicing parameters for different types of fibers. It also has 13 fixed programs for standard and specialty single-mode fibers and multimode fiber, and an automatic fiber type detection feature that will inform you if you are attempting to use the wrong program for your fiber type. Splice losses up to 10.0 dB can be programmed for an in-line attenuator with the characteristic non-reflectance of a fusion splice. With the new software upgrade tool, a customer’s M90 can be upgraded with the latest software via a printer cable and PC connected to an e-mail system. In the fully automatic mode, the lighter and smaller M90 Series 6000 provides a typical average splice loss better than 0.02 dB for both singlemode fibers and multimode fibers.